Visit the Fall 2011 edition of Library Lines, the newsletter of the Francis A. Drexel Library. 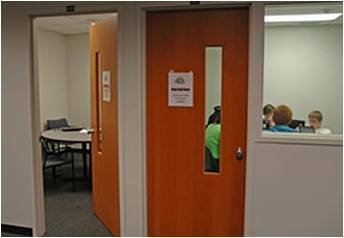 Beginning Sunday April 17 and through the end of finals (Saturday May 7th), students may reserve one of four study rooms located on the 2nd floor of the Drexel Library: Rooms 216, 217, 219, and 220.
the Presentation Practice Room is available for students working on group projects and presentations and may be reserved year round for two-hour blocks. The room has a white board and 42″ LCD screen. Please note: Valid SJU ID is required to enter the library. Francis A. Drexel Library is thrilled to announce that The Hawk Digital Archive is now available to you! The Archive covers the student newspaper from June 10, 1930 (volume 1, number 1) through Sunday, May 19, 2002 (volume 75, number 2), is fully searchable and replicates the content and layout of the original newspaper page. The Archive can be accessed from the Library’s homepage – just click on icon in the lower right-hand corner. The link has also been included in several of the Library’s Research Toolkits, including the one designed especially for alumni. We hope you enjoy reliving the history of SJU through the pages of The Hawk Digital Archive. FYI, The Hawk Digital Archive is best viewed with a screen resolution of 1280×1024.